It's Giving Tuesday, y'all! Practice your online giving, and donate to our local nonprofit partners participating in Giving Tuesday. On March 4th, you can fire up those online giving skills again to help us Amplify Austin, with Austin's very own first annual giving day! Austin Involved, making an impact, one nonprofit at a time! Austin Involved is a program of I Live Here, I Give Here®, where young philanthropists contribute $25 a month and vote on a partner nonprofit to receive the pool of funds, as well as a 3 hour volunteer project for members to learn more about the mission, vision and clients of the nonprofit. In October, Austin Involved was at Planned Parenthood in Austin. Did you you that more than 1,000 women in the Austin area will be diagnosed with breast cancer this year? Volunteers helped to promote women's health by making over 600 "breast-health" goodie bags in Spanish and English to be used as part of Planned Parenthood’s outreach. They also made over 100 calls to some of the organization’s generous donors to thank them for the contributions that allow Planned Parenthood to take care of the uninsured or underinsured men and women in our community. DISCOVER. DO. DONATE. ARE YOU IN? To find out how to join Austin Involved, find us here or contact Celeste at 512.432.1936 or Celeste@ILiveHereIGiveHere.org. It's November, a time for showing our thanks - something many of us do by giving to others. But how can we be responsible donors with our limited dollars? The answer is to ask basic questions about who's on the receiving end of our giving. With a little effort, we can learn a lot about who's accepting our donations. Starting with our website, you can view a list of our partner agencies whose operations have been thoroughly audited for both efficiency and outcomes within the last two years. When you're ready to do more detail-oriented research yourself, the Federal Trade Commission provides a suggested "Charity Checklist" and a list of resources (noted below) to help us direct our donations to legitimate causes. It takes you hours, and maybe many days, to earn the money you give to others - making the 20 minutes you invest in background research time well spent. November's Fabulous Donor Of The Month! This month we are proud to honor Kimberly Scheberle of Little Helping Hands. Kim has been an active volunteer with Little Helping Hands for the past two years, serving as Board President and managing several key fundraising events. 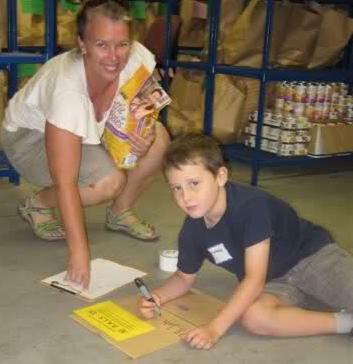 In addition, she leads family volunteer activities on a regular monthly basis. She not only gives her time and money for personal benefit, but shares this experience with her family and in particular her young son, to teach him about the value and importance of giving. She exemplifies family philanthropy at its best by stepping up to volunteer as an individual, with her family, and by donating to multiple organizations within our community. Her willingness to share her wide variety of skills has been a tremendous asset to Little Helping Hands. Thank you, Kim! And congratulations on being our donor of the month! Calling All Amplify Austin Ambassadors! You're signed up and ready to go. What next? You know our goal: we're raising $1 million online in 24 hours for over 300 local nonprofits. Your help is gonna make that happen. MAKE SURE THAT YOUR FAVORITE NONPROFITS ARE SIGNED UP TO PLAY ON AMPLIFY AUSTIN DAY . We have over 150 nonprofits signed up (CHECK OUT OUR LIST) and we want all the organizations whose missions excite you to be included. Share with them our video, the Amplify Austin webpage, and have them contact us with questions. We're excited to get them onboard! Ambassadors, watch for more exciting news coming your way soon! Looking for an introduction to our Ambassador program? We welcome you to explore more here. Mental health issues… oops, I said it! We all get a little squeamish when the subject arises. Unlike cancer or heart disease, mental illness is hard to understand and the solutions don’t seem nearly as neat or clear-cut. However, many of us and our families are impacted by mental illness. In my life, I have seen friends struggle with children suffering from a mental illness like schizophrenia or addiction. Several have lost a child to suicide, a most heart-breaking outcome of mental illness, which I experienced on a more personal level when I had a team member take his life a couple of years ago. I vividly remember the shock of sitting in a meeting and learning that Jason's supervisor had gone to his house to find that Jason had committed suicide. What a loss we all felt, and what a waste. Jason was a smart, talented and especially kind, young man. He did not have to die. There are organizations in this community working day and night to help those of us who suffer from mental health issues. All November, we’ll be talking about the importance of these nonprofits’ work as we use our monthly issue paper and web videos to spotlight Central Texans who provide mental health support. So that’s the topic of the month. Learn more. Do something to help. Starting this month, our website donor videos will have a new look and feel. Not only are we going to start meeting your donors on site at your nonprofit location and highlighting the great work you do first hand, we’re also merging the Community Needs Spotlight Donor Story and Austin Involved’s Charity of Choice opportunity into one video. In November, three nonprofit donor videos will be highlighted on the I Live Here, I Give Here website. Austin Involved members will review those videos and vote on the nonprofit they choose to receive their monthly donations, as well as their three hour volunteer project. Check out our first video of the series, highlighting the work of SIMS Foundation. What's New With Austin Involved? November News! Austin Involved, focused on Healthcare for the Uninsured! Are you an I Live Here, I Give Here Partner Agency? Would you like to be considered for Austin Involved's next CHARITY OF CHOICE ballot? More more here and contact Celeste at 512.432.1936 or Celeste@ILiveHereIGiveHere.org. Attention All Nonprofits! Amplify Alert! To sign up for Amplify Austin, please go to our Amplify Austin page and click on "Nonprofits, Say You'll Play!" towards the bottom of the page. The opportunity to participate in Austin's first online day of giving CLOSES January 7, 2013. WAHOO! IT'S AMPLIFY AUSTIN TRAINING TIME! Once you've committed to participating, nonprofits must attend two required trainings. Please RSVP here as the room's capacity is limited. The $25 fee for each training is waived for Partner Agencies. Unless indicated otherwise, all trainings will be held in the community room on the ground floor of 98 San Jacinto Blvd (the office building west of The Four Seasons Hotel). Last month I had the pleasure of participating in the monthly luncheon of the Austin chapter of the Association of Fundraising Professionals. Its goal was to remind each of us that the data and material we continuously gather to measure our community impact is important, but we mustn’t lose site of the people behind the data. It got me thinking about the importance of storytelling. WHAT ARE THREE ELEMENTS OF A GOOD STORY THAT WILL MAKE YOUR MISSION MEMORABLE AND MOTIVATE SOMEONE TO GIVE? Here are three reasons why storytelling is crucial to nonprofit success. Like this video by Landor Associates demonstrates, when facts and information are framed by a compelling story, you’ll not only hold the attention of your audience, but you’ll also make the information memorable. No matter how compelling your facts are, if your audience isn’t interested in what you’re saying, all the information will be lost on them. I recently asked a group of nonprofit leaders to put a face on one of their clients. This one stood out for me, “My client is Ruby, a 22-year-old single mom working in a convenience store. While sitting in traffic on I-35, her car’s check engine light comes on as she rushes to pick up her 2-year-old from her Mom’s place, who provides regular daycare. Ruby now has to make a choice about the little money she’s saved – keep her wellness checkup or get her car fixed?” Within seconds, Sarah Wheat at Planned Parenthood captured the dilemma many working, single mothers face when they fundamentally understand that caring for their personal health ultimately supports the entire family. When stories are memorable, they’re easy for listeners to recount for the future. October was Healthcare for the Uninsured Month and I passed on Ruby’s story countless times, because it was easy and memorable. Arm your audience with a good story. They’ll be able to communicate the details of your mission more clearly. Another recent compelling nonprofit story came from Special Olympics Central Texas – their client’s name is Audrey and she’s running in a race for the first time. Several times, Audrey stumbles, bloodies her knees and elbows. Because assistance is not allowed during a race, Audrey picks herself up each time and keeps going. When she finally reaches the finish line, Audrey jumps up and down, screaming, “I did it! I did it! I did it!” Audrey’s mother then barrels down the bleachers wanting to reach her daughter, but security won’t let her, because all of the participants hadn’t finished the race. Audrey’s mother than said, “But you don’t understand, she’s never spoken out loud before.” I have yet to tell that story without tears welling up and when I recently shared it with a friend, she immediately made a donation to Special Olympics Central Texas. It may seem easier to put together a powerpoint presentation with lots of statistics than craft up an exciting narrative, but as any storyteller will tell you, a little extra time and brainpower is worth the payoff. As a former journalist, I’m happy to meet with you to help uncover some of your most compelling stories to help your nonprofit live happily ever after. Just ask. With much appreciation for the work you do!